Download PRINT and BRING this cue sheet to the ride. 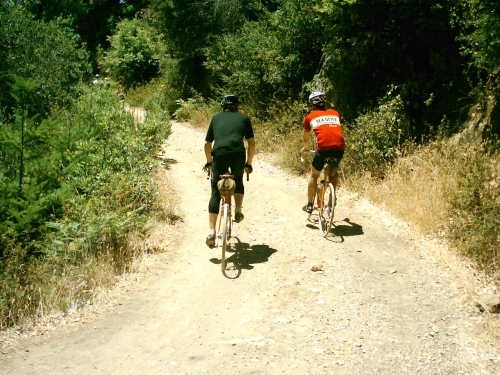 On July 11th you are invited to do the 2009 edition of the 200k Mixed Terrain ride, La Ruta Loca Randonnee (LRLR), that loosely follows Brevet event rules. We will start from the San Francisco Marina Safeway at 6:00 am. What is that? well a brevet is a long distance recreational ride (not a race) that is timed, the time alocated for a 200k event is 13.5 hrs. You can find more about brevets at the San Francisco Randonneurs website. The difference here is this event covers mixed terrain, both paved and off-road sections (about 60%-40%) I've been mapping mixed terrain routes in Marin since 2005 and have come up with several detailed cue sheets for different routes that start at the Golden Gate Bridge and go North to the Marin Headlands, Mt Tam and a little beyond, this has been a real labor of love, you can read my Jul/07 posting here. The 2009 cue sheet will be posted here soon. LRLR 200k has about 15k of climbing most of it on fire-roads. We start at the Marina Safeway and ride to Muir Woods via the Marin Headlands then climb to Pantoll Ranger Station using Deer Park, continue to Lake Lagunitas using mostly Mt Tam fireroads, connect to Bolinas/Fairfax rd, down to Alpine Dam, up to Bolinas Ridge down to Hwy 1 via Randall Trail, pay a visit to Mike @ Black Mountain Cycles in Point Reyes Station to get your proof of passage, ride back to Fairfax and Larkspur using the regular bike route, before Camino Alto turn left and do the full Paradise Loop, at Mill Valley keep towards Mt Tam, up to Railroad Grade, West Point Inn, down to Pantoll Ranger Station, connect to the Marin Headlands via panoramic Hwy, get to Miwok Stables and continue on the fire roads to Conzelman, down to the Golden Gate Bridge (San Francisco Side) and you are done. Sounds like fun? There are "Controls" where you should prove you where there by either getting a receipt, signature/stamp or write some obvious thing about the location, it is different for each Control. Use whatever bike you want, road, cross, mtb, just make sure your brakes work and the bike overall mechanical condition is very good. I use an unsuspended ti MTB with 1.5" hybrid tires because that is what I have but others have done parts of this route in all sorts of bikes/tire combos, single speed, fixed, fixed 20", road, cross... Just pick one and ride. If you get in trouble due to a mechanical, or hopefully not, "health" issue there are many places to cut the ride short; the same places serve well to cheaters but I hope no rider does cheat as that misses the whole spirit of doing this type of ride. You have 13.5 hours to complete the route and cover every inch as per the cuesheet. To put the ride in perspective, I am a middle of the pack rider in the San Francisco Randonneurs regular brevets and last year completed LRLR route in 12.5 hrs so I think this will challenge most riders. No awards, no entry fee, just the fun of a though ride in our corner of the world. Don't think you can complete it in 13.5hrs? So what, nobody is going to pass judgment on you, that is your job. Come out and ride and finish in whatever time you can. This is NOT a sanctioned brevet or event sponsored by the San Francisco Randonneurs, just a regular informal ride, if you decide to do it you ride at your own risk. It was a nice hard day on the bike. I will have a writeup in a day or two and will create a link from this page to that one. Missed the start due to family obligations; do you mind giving a recap of your ride? I am interested in what bike you rode, tire choices, water or food issues, or where to get either.